We sing a joyful blend of contemporary praise songs and traditional worship hymns. 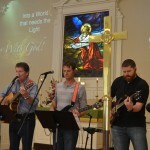 Our talented praise band/team leads music on Sundays. You’ll hear piano, guitars, and organ music. Words to songs are projected onto screens at the front of the church, but we still have hymnals in our pews.